Once someone has earned your trust, you and that other person would do anything to protect that bond. You get your mom flowers for Mother’s day because she raised you. You make your spouse dinner because your spouse makes the bed the way that you like it. You put your kids to bed each night because, well, they’re your kids! You visit your friend who recently lost a parent because they did the same for you a few years ago. You bend over backwards for the boss who has done the same for you. … that just can’t get themselves to TRUST even one more doctor. At Barefoot Rehab, we’ve found that people are willing to let us fix their pain when we earn their trust first. the many testimonials we have on our Proof page, the 44 Five-Star reviews we have on Facebook, or the 27 Five-Star reviews we have on Google. 75% of our patients have been referred by people they already know. So, we earn their trust through the trust of people they have relationships with. being really nice, huggy people. caused you to see 3-5 other doctors without a quality diagnosis or a permanent reduction in your pain. lasted months and before you know it, you’ve had this nagging pain for over a year. grown in intensity to the point where you can barely think and do anything in your days. become such a nuisance that you’re wondering if you ever going to be able to do the things you love again, whether that’s playing tennis, gardening, or playing with your kids. Good news for you! We’ve thought up one more thing to earn your trust. 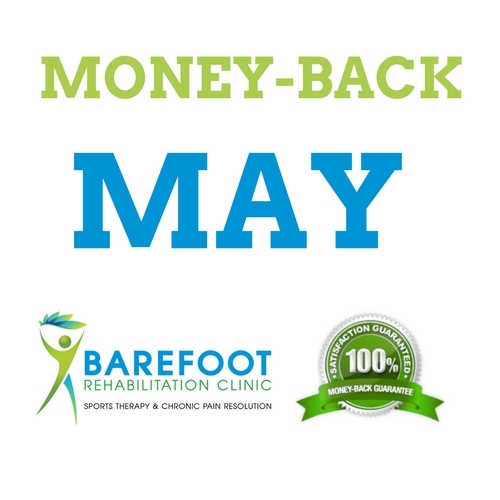 In Money-Back May, we’re offering all new patients who contact us in May the opportunity to request 100% of their money spent back (up to 5 treatments), no questions asked! New patients now have nothing to lose in order to try to experience less pain (besides the time spent in getting to our office). So … are you scared to come see one more doctor because of the fear that we might be another doctor who lets you down? Don’t worry, we’ll earn your trust so you’ll let us finally fix the pain that you haven’t been able to get rid of. Schedule a New Patient Visit during the 1st 2 weeks of May (expires May 12, 2017) and you’re eligible to receive your money back if you’re not happy with our care! Money-Back May is a 2 week promotion that ends May 12, 2017. Must pay our cash rates (not eligible for insurance patients). We reserve the right to not see someone based on the severity of the diagnosis that will occur during the New Patient Visit. The 100% Money-Back Refund is only for the New Patient Visit and Five (5) Treatments.